What is a Tensile Fabric Structure? A tensile fabric structure is a structure usually consisting of a framework (usually steel, aluminium or wood) supporting a tensioned fabric membrane roof. What are Tensile Fabric Structures used for? Tensile structures are typically used as a roof, a standalone structure or as an outdoor cover. Their lightweight fabric membranes can economically and attractively span large distances with rapid build times and a much-reduced cost in comparison to traditional building mediums. They can be used to provide shade, waterproof shelter or a fully insulated fabric building. Have I seen one before? More than likely. Tensile fabric structures are used in applications ranging from small shade sails to complete fabric buildings. You may notice them in your local school playground or as walkways in airports and shopping centres or as large covers over stadium terraces. The largest example of a tensile structure in the UK is the O2 Arena in Greenwich, London. How do Tensile Fabric Structures work? Tensile Fabric Structures work by virtue of their doubly curved shaped fabric. This double curvature gives the fabric membrane the ability to efficiently resit and withstand the loads it will be subjected to (such as wind or snow). In order to create the double curvature, the fabric needs to be tensioned into position. We call this pre-tension or pre-stress. The pre-tension can be applied to a membrane by stretching it from its corners or edges and / or by tensioning catenary cables around the perimeter of the membrane, thus changing its shape and introducing the double curvature. There are two types of double curvature, synclastic (as found on air inflated structures) and anticlastic (as found on Tensiles). Our most popular structure, The Azure, is a classic example of an anticlastic form and is known as a hyperbolic paraboloid or ‘hypar’. With low and high points opposite each other it has opposing curvatures. We try and introduce a high degree of shape and form into our structures as the greater the height difference between the highs and lows, the lower the resultant forces will be at the corners of the membrane, therefore the lower the pre-tension loads will need to be to achieve the desired resistance to any live or dead loading. The fabric can then be lighter weight and the tensioning system and supporting frame can also benefit from these lower pre-tension loads. Conversely, the flatter the membrane, the higher the pre-tension loads needs to be and the resultant necessary increase in fabric, steel and canopy hardware sizes can have significant cost uplifts. Other common anticlastic forms would be the conic and barrel vault. Nearly all tensile forms are created from one or a combination of these three basic forms (hypar, conic and barrel). How long do Tensile Fabric Structures last? This can vary depending on the design and specification of the materials and on other factors such as maintenance, cleaning and location. Typically, a shade sail would last around 10-15 years and a highly engineered PTFE structure would last in excess of 30 years. 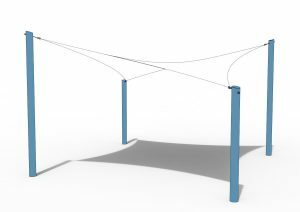 Fabric technology, design and manufacturing techniques are advancing all the time and we’re seeing the lifespans of tensile structures increase as a result. Do Tensile Fabric Structures need maintenance? Yes, and older structures especially. Your O&M manual will tell you the cleaning and servicing intervals, but it is typically carried out on an annual basis. Older fabric structures are often less dimensionally stable than newer ones and may have fabric that will creep and stretch. This stretching will lessen the pretension in the fabric and mean the membrane is less able to resist loadings such as wind and snow. This could lead to premature failure of components (or the membrane) and could make the canopy more susceptible to water and snow ponding. It is also important that Tensile Fabric Structures are regularly cleaned. As well as keeping the canopy looking at its best, if left uncleaned, dirt and particulates can build up may degrade the canopy, reducing its lifespan and ultimately its structural integrity. Tensile canopies in higher polluting areas such as cities or airports are especially susceptible. We offer full inspection, cleaning and maintenance packages. Please contact us for more information. I see you have a range of structures, but I want something different? No problem! Whilst we have a large range of pre-designed and pre-engineered structures to pick from we realise that they may not work for everyone. A large part of what we do is creating bespoke structures. This can range from small sizing tweaks of existing designs to creating something totally unique for you and your project. Do you design and engineer your structures? We sure do! We design and engineer to the latest Eurocodes. These are applied to your specific location to ensure that whatever we build for you is engineered to cope with anything that Mother Nature can throw at it. Yes, all our structures come with a 10 year guarantee provided that they are maintained in accordance with their O&M manual. Depending on the material chosen for the membrane they can either be fully waterproof and shade or just for shading. Most of our smaller structures can be specified with either a shade sail canopy or a waterproof canopy. Larger tensile fabric structures nearly always use a waterproof fabric canopy. How much do Tensile Fabric Structures cost? This is a difficult question to answer as there are so many options, variables, factors and specifications to consider. The size and scale of the structure, its design, location, foundations, etc. can all have a huge bearing on the cost of a project. Generally, our predesigned shade sails would range from about £100m – £300m/2 and our tensile structures from £200 – £500m/2. Bespoke tensile structures usually cost upwards of £300/m2. How long do Tensile Fabric Structures take to install? The installation time can vary hugely depending on the structure size, shape, complexity and its location. Small shade sail structures are typically installed in a few hours, but we have been involved in the installation of much larger structures that can take several months. Which are your most popular structures? Our most popular structures are the Azures Hypars, Atacama Umbrellas and our bespoke Commercial Shade Sail Structures. We use Gale Pacific Commercial 95 which offers the ultimate combination of maximum Sun protection (up to 97.7% UV block), strength and durability to ensure a long-life performance. Available in a large range of colours, its knitted lock stitch construction offers more air movement and better channeling of cool breezes whilst offering superb fray and tear resistance. Made from high quality UV stabilised HDPE. It’s strong and stable and suitable for harsh conditions and can be recycled. Monotec 370 Series shade cloth is the perfect solution for shade sails and structures. Uniquely made using only 100% round monofilament HDPE yarns, Monotec 370 Series provides consistent protection to people and property in the harsh climates. Monotec is available in a range of vibrant colours. It is more expensive than Commercial 95 and has a higher strength to weight ratio. This is our ‘go to’ for most of our Tensile Structures and you’ll see this on most of our products. It comes in a huge range of colours, is waterproof and is very dimensionally stable. It’s incredibly strong, durable, easy to weld and work with and has a higher strength to weight ratio than other type 1 PVC fabric. It is simply the best available on the market today!